Hildegard L. Binder Johnson’s career set the standard for geographer’s teaching and researching in liberal arts colleges. She was an excellent teacher, a widely published and respected scholar, and a superior citizen of the academic and local communities. She championed geographic education during an era when university faculty strove to separate themselves from teachers and the issues of schools. Born in Berlin on August 20, 1908, Professor Johnson died in Minneapolis on January 18, 1993. The only child of a middle class government official, she grew up in a stimulating and rigorous environment she described as Williamian as opposed to Victorian. Raised with a strict sense of duty, Professor Johnson was devoted to her parents and proud of her Berlin heritage and accent. She fondly recalled after-dinner walks with her father along the Hauptstrasse of Berlin Schoeneberg, during which he pointed out to her evidence of change in the landscape of the city. She attended Chamisso Realgymnasium, a small private school for young women, a selective school designed for the intelligent daughters of upper middle class families who did not want their children to attend a finishing school. Professor Johnson followed the German academic tradition of studying at several universities. She began her studies at the University of Rostock in 1929, where, while pursuing her academic work, she passed the tests for the German Republic’s sports insignia. From there, she went to Marburg and finished her undergraduate program at the University of Innsbruck. Her post-graduate work was done at the University of Berlin, where she received her Ph.D. in 1933. Her research on African settlement by Germans (“Die Verteilung der Euroeaeer in Afrika”) attracted the attention of the NAZI expansionists with whom she disagreed. She fled the NAZIs in 1934, after taking the State Examination. She was fond of recalling how her thesis was the first to have a map printed in two colors. Germans in Africa were represented with red dots to emphasize German presence in that continent before Germany was stripped of its colonies. After supporting herself as a teacher in England and at Mills College, she married Palmer Johnson in 1936. They had two daughters, Gisela and Karin. She was one of the few women of her generation who combined teaching, research, and rearing a family. Professor Johnson came to Macalester College in 1947 when the returning GIs caused a boom in higher education. She founded the geography department at Macalester and spent her entire career justifying geography in the liberal arts curriculum. It was a difficult task, but the returning veterans loved her. She knew about the world and many of the veterans were eager to learn more about where they had been and why they had been there. Her political geography courses enrolled to capacity. She transferred her interest in overseas Germans from those in Africa to those in North America and published extensively on German immigration. In fact, she had two articles on the German immigration published in Germany before the outbreak of World War II. Professor Johnson’s first major geographical publication in the United States was “The Location of German Immigrants in the Middle West,” Annals AAG (1951). She used the manuscript census to determine the actual pattern of the population and assiduously studied letters and diaries in state archives. Although German immigrants were numerous in the midwest, and constituted the largest immigrant group to Minnesota, little had been written about them and the geography of their settlements. Hers was the definitive statement on the geography of the settlement. In addition, she wrote several short pieces on the acculturation process and the impact of significant individuals. She approached this topic as a scholar and was not interested in filiopiety. In those years, most of her students at Macalester were preparing to be teachers, and they filled her Human Geography course to overflowing. As a result, Professor Johnson became quite interested in education and joined the organizations of social studies and geography educators. She was President of the Minnesota Council for Social Studies and served on the Executive Committee of the NCGE. Her insights in education and her zealous belief in the value of geographic knowledge caused her to be deeply involved in shaping the knowledge base of professional educators. She wrote several pieces on geography teaching and the place of geography in the curriculum and she had a huge impact on geographic education in the state. She published four articles in the Journal of Geography, including an article on geography in the grocery store which may have been the first of that genre. She was an active member of the NCGE and counted among her best friends the small group of women professors of geography in small colleges and state universities that labored faithfully for the cause of geographic education. She also wrote several pieces on geographic education for the Bulletin of the Minnesota Council of Social Studies. Her work on the Steering Committee of the AAG’s High School Geography Project was the climax of her activities in geographic education. Professor Johnson was an innovative teacher and could not find an introductory text book that satisfied her demands for depth and breadth. Therefore, she gave lectures that were carefully structured and timed. She had made a careful study of testing and was proud of her ability to construct multiple choice questions that tested high order thinking. In 1958, Professor Johnson taught the first television course for credit over ETV-KTCA. Professor Johnson’s research in historical geography was focused on the emerging Midwestern landscape. Her second major geographic publication was “Rational and Ecological Aspects of the Quarter Section: an Example from Minnesota” in Geographical Review (1957). This publication developed out a of long term interest in processes used by Europeans to take the land. The rectangular survey was different from the land division system of Germany and she was constantly reminded of the influence this basic feature of the landscape had on a variety of other cultural features. She, of course, was not a “land survey determinist,” but she documented several significant impacts of the survey on the emerging agricultural lifestyles. In her article, she set forth the process of taking up land in the area and how the land division presented problems for the original settlers. For example, the square parcels sold to farmers frequently contained a mixture of bottom land, valley sides and upland. This combination created two story agriculture whereby farmers had to commute to distant upper fields. The arrangement also played a role in increasing soil erosion. This article was part of a long-term study she conducted on the Whitewater River Valley in southeastern Minnesota. The second article to come out of Professor Johnson’s research project was “King Wheat in Southeastern Minnesota: A Case Study of Pioneer Agriculture ” Annals of AAG (1957). In this article, she recounts the process through which wheat became the first cash crop of the frontier. She illustrates how production was organized, the emergence of small mill towns and then the passing of the wheat frontier to areas further west. In many respects, Professor Johnson’s work on the Whitewater Valley is similar to other “cross section” historical geographies of that period. She used interviews, field observations, and primary sources to develop the sequent occupance of the area. Her examination of erosion in the Whitewater Valley brought her into close communication with the Soil Conservation Service and other conservation groups. She became an articulate advocate of conservation and introduced a field course on conservation into the Macalester curriculum. These and other activities earned Professor Johnson an award from the Isaac Walton league. She gave a paper at the 1960 AAG Convention on the transfer of land from private ownership back to public control in the development of the state park that was created in the valley. The final publication on the Whitewater was ” Geographic Research in Outdoor Recreation: A Case Study of Recreational Usage in the Whitewater Valley, Minn” published by the Great Lakes Forest Experiment Station in 1961. In the 1960’s, Professor Johnson’s research shifted from the local area to the history of cartography and the nature of geography. She also returned to her first love, Africa. In 1962, she published one of the first pieces in English on Von Thunen in the Annals. However, this work was overshadowed by the publication of Carta Marina 1525. This treatise on the history of the map and the social context in which it was made won her acclaim from those scholars working on the history of discovery and the history of cartography. The book discusses the great map as a reflection of the local culture of Central Europe as well as a world view. The book contains a chapter on mapmaking technology as well as lively discussion of the business of book selling and mapmaking. 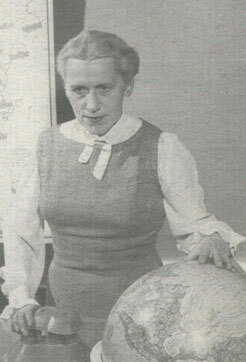 In 1967, Professor Johnson published her piece on the location of Christian missions in Africa in the Geographical Review. This was representative of her style of research. She used primary materials from mission aide societies and then traveled to Africa to see some of the places for herself. She made a special effort to visit all of the former German territories in Africa. That article was quickly followed by “The Role of Missionaries as Explorers in Africa”, Terrae Incognita (1969). Professor Johnson wrote dispassionately about the role of missionaries in Africa. She was not an active member of a church during these years and sought neither to glorify nor minimize the impact these people had on Africa and the Africans. She loved field work, but was not able to travel extensively until Macalester began to underwrite her trips in the later part of her career. She relished arduous jaunts to Africa and Asia as well as Europe. She frequently asserted that one could not understand their home until they returned from foreign travel. Throughout this period she continued to publish on topics in geographic education. In 1976, after several years of work, she published Order Upon the Land: The U.S. Rectangular Land Survey in the Upper Mississippi Country. In many respects, this was the summation of her work in historical geography. It focused on the role of culture in its many forms as a maker of landscapes. It is a carefully written piece with several wonderful illustrations. Like her other work, it contains fresh insights gained from field observations. Professor Johnson was always proud of the way she could integrate her research with her teaching. This book is no exception and contains photographs taken by her students while they were on field trips with her. She also wrote several thoughtful essays on the evolution of the American landscape which were designed for public presentation. The published versions of these papers are not able to present the wealth of illustrative material she used in her presentations. She was a visual person and whenever possible used concrete examples to illustrate her generalizations. Professor Johnson was one of few geographers who published in the journals of other disciplines. Her work appears in Rural Sociology, The American German Review, The American Journal of Sociology, Agricultural History, The Conservation Volunteer, Education Landscape, Minnesota History, The Pennsylvania Magazine of History and Biography, The Iowa Journal of History and Politics, and The German Quarterly. She was a broad based scholar and at home with scholars from all disciplines. She also published extensively in the American and German Geographical Journal. In 1981, Professor Johnson’s work on German immigration reached its climax with the chapter “The Germans” she wrote for the book, They Chose Minnesota. The much-edited chapter contained vast amounts of information about the immigrants, their hopes and frustrations, and the geography of their settlements. Her own experiences enabled her to empathsizes with them in a special way. Unfortunately, the depth of her understanding could not be squeezed into this chapter and she did not have time to write a book on the Germans. In total she published twenty-five articles on German immigration. Her work was recognized in 1992 by the Award for Outstanding Achievement in German-American Studies given to her by the Society for German-American Studies. The citation called her “an outstanding German-American Scholar of Our Time”. For most of her career, Professor Johnson maintained a very heavy teaching load and was active in a variety of social causes. She worked hard and expected those around her to do likewise. Her 1958 Honors Citation by the AAG gave her a great deal of satisfaction because it was evidence of her success at working in a discipline that did not welcome women. Her habits of hard work lasted throughout her life. Professor Johnson published two books, 69 articles as well as several abstracts and editorials. 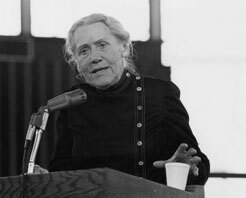 When she retired in 1975, Macalester awarded her a Doctor of Human Letters, Honoris Causa. The department maintained her office and provided her with secretarial support for another decade, thereby enabling her to have a productive retirement. Her last publication appeared in 1990, 57 years after the first. Published two books, 69 articles, numerous abstracts and editorials.